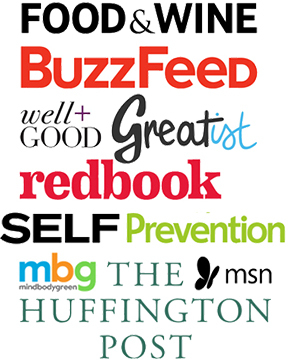 Welcome to Women x Wellness, a series of interviews here on Grok Grub with female entrepreneurs who are changing the wellness industry for the better, and innovating to benefit our health. Lisa Curtis– founder of Kuli Kuli, a mission-driven startup that is creating a market for the superfood moringa–sat down with me for my inaugural interview. Lisa and her startup Kuli Kuli came to mind when I developed the concept for this series of blog posts because of her story as a Peace Corps volunteer experiencing first-hand the malnutrition that plagues rural communities in West Africa, and her decisions to effect positive change herself. After a few months of volunteering in Niger with limited access to fruits and vegetables, Lisa found herself experiencing early signs of malnutrition — a condition that affects over 18 million children across West Africa. Then she discovered moringa oleifera, a local tree with highly nutritious leaves, and began to regain her health after incorporating it into her diet. Lisa returned to the United States and founded Kuli Kuli to develop a a market for moringa in support of communities still suffering from poverty and nutrition in Africa. Thus far Kuli Kuli produces moringa snack bars and a newly-launched pure moringa powder for flexible integration into a modern diet. Moringa: a hardy, common plant growing like a weed throughout vast areas of Africa, India, Thailand, the Philippines… this is the next superfood? Moringa is packed with calcium, protein, and vitamins—it’s more nutritious than kale! Kuli Kuli sells the leaves ground up in snack bars, and in pure powder form. They have a green, earthy flavor, slightly smokey, but not as bitter as kale or as spicy as arugula. A lot of people substitute moringa powder for kale in smoothies because it’s much easier to add a scoop of moringa powder to your smoothie than spend your morning ripping up kale leaves. Our mission to use our proceeds to end of poverty and malnutrition in the communities where our moringa is sourced makes this real-food boost to your health a win-win. Moringa is extremely vitamin-rich, yet the population of West Africa where it grows suffers from malnutrition. What’s the disconnect? In many parts of moringa’s native geography it is considered a famine food, only eaten by the poorest members of the community. An additional contributing factor to the negative perception of moringa is the method of preparation for consumption (boiling for long periods of time) which strips away vitamins and nutrients… which is why an important aspect of Kuli Kuli’s mission is educating the local populations on the benefits of moringa, and on methods of processing it that maintain its beneficial properties and ways of incorporating it into their diet on a regular basis. In the United States, response to the pure powdered moringa has been very positive because it’s an ingredient that can be incorporated in many different ways according to different dietary preferences, similar to the way in which acai, quinoa or chia–for example–have become widely-known and comparatively mainstream. You’re the founder of a superfood startup, developing a domestic market plus establishing an ethical and sustainable supply chain overseas… what is one thing you personally do every day to maintain your energy, health, and balance? I keep a calendar beside my bed, and every night I make a note of something during the day that went particularly well, or that I’m grateful for. In this way, I keep focused on positivity and have a tangible record of wins and blessings, both large and small, that happen over time! That’s a fantastic daily way of staying focused yet reflective! In a broader sense, what’s next for moringa and Kuli Kuli? Our mission will continue to be improving nutrition and providing a livelihood, with a focus on women farmers. But we’ve come a long way since our crowd-funding campaign in 2013 to do our first big manufacturing run… we’ve expanded both our supply-chain of moringa and also our distribution of product in the United States (sold in more than 300 stores nationwide) in our first full year on the market. We’ll also continue to expand the availability of our recently-launched pure moringa powder, which has gained great traction as a painless way to get daily required servings of vegetables. We’ve been very impressed with the sales of the moringa powder initially, and the creative ways in which we’ve seen folks integrate it into their diet. 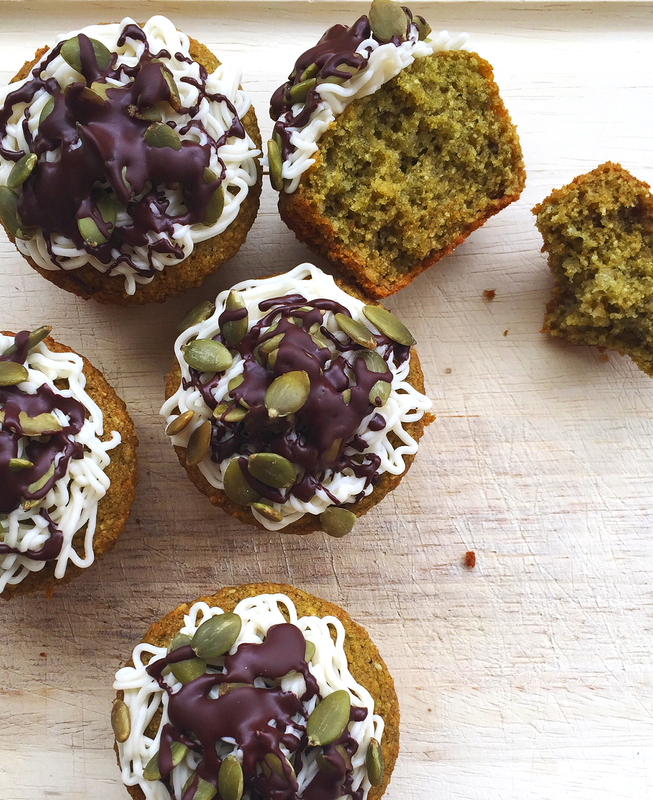 These green pumpkin-seed cupcakes feature moringa: a vitamin-rich superfood that's more nutritious than kale! Preheat the oven to 375° F. Grease a silicone muffin pan with coconut oil, or line a muffin tin with parchment liners. 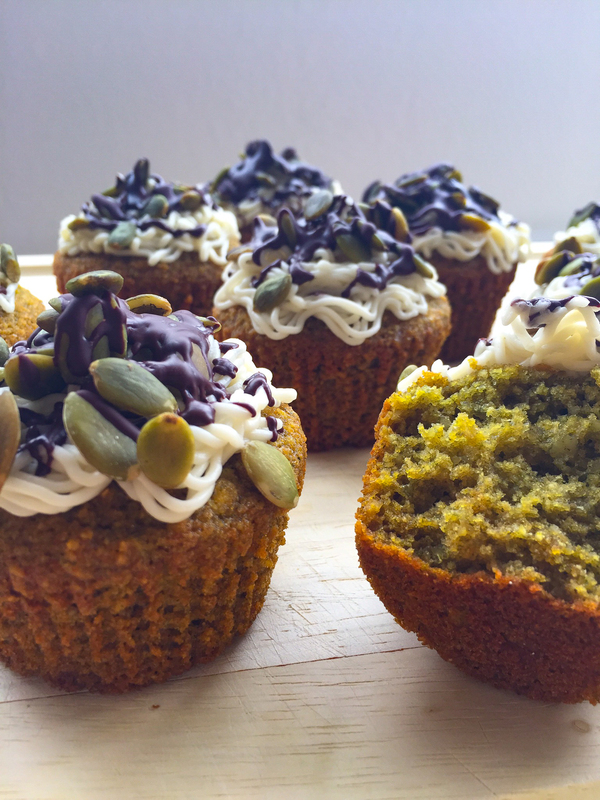 Pulse the coconut flour, tapioca flour, pumpkin seeds, moringa powder, baking soda and salt in a food processor until the pumpkin seeds are ground into a fine meal. Add the eggs, oil, honey and puree until smooth. Spoon into the cups of the silicone mold or muffin tin, then place in the preheated oven. Reduce the heat to 350° F, and bake for 20-25 minutes or until a tester inserted comes out clean, then set aside to cool. To make the frosting, whip the shortening, honey and vanilla until smooth. Fit a pastry bag with a coupler and tip (I used a Wilton No. 233 Multi-Opening Decorating Tip), then load the frosting into the pastry bag. Once the cupcakes have cooled, pipe the frosting on top in the design of your choice. Top with melted chocolate and more pumpkin seeds. if desired. It’s got this yummy earthy taste. Keeps the cupcakes from getting too sweet! I have to pin this recipe I have some moringa. Yummy looking cupcakes & great cause. You have some moringa! You’re in business, then! wow, these look delicious! Ive never heard of moringa powder, but these look so good im gonna find ut! These look really interesting but tasty at the same time. I have a huge sweet teeth, so anywhere I can squeeze in healthy alternatives is great! This looks like such a wonderful recipe! I will def be making this for the Fall season ahead! I love all things pumpkin! Thank you for sharing!!! I love that there are so few ingredients, and it’s super easy to make. These would be perfect for breakfast. Ohhhh great way to use moringa! It’s a fun one, for sure!